You can leave the hard and exhausting cleaning after the refurbishing and decorating of your property to the professionals in our company. Our cleaning technicians are supplied with powerful and advanced machines, tools, preparations and effective solutions to remove stubborn stains, plaster and cement leftovers. They carry out thorough and effective sanitising of living areas, lofts, basements, bathrooms and kitchens. We can clean the patio and external areas of your estate if you need it washed and rid of the construction wastes. Our workmen will remove the excess building leftovers and materials to the designated places and ensure the spotless condition of your property. Use our after builders cleaning services, available in and around Hammersmith at affordable rates. We can spare you the time and efforts spent in dusting, hoovering, washing and wiping walls, ceilings, tiles, bathroom appliances, fixtures and fitting and cooking areas. The work of our cleaners include mopping and scrubbing hard floors, washing tiles and chrome surfaces, wiping clean doors, windows, walls and ceilings using suitable detergents. They gather and remove the excess materials and leftovers from the building and decorating work, remove splashes and stains from paint, latex, cement and plaster. We offer effective and inexpensive after builders cleaning in W6 which will ensure the healthy and habitable condition of your property. In case you need assistance with the removing of the debris, stains, plaster, cement and leftovers from the renovation, repairs or building work which you have had in your home or business estate, contact us. 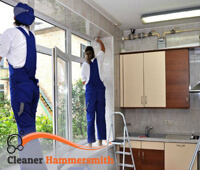 We can send as many workmen as necessary to your address to carry out the after builders cleaning you need in Hammersmith, W6 or anywhere nearby. You will receive first-class services.